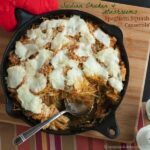 Add some veggies to make a healthier version of your favorite cheesy comfort food. You can make it gluten free, too! 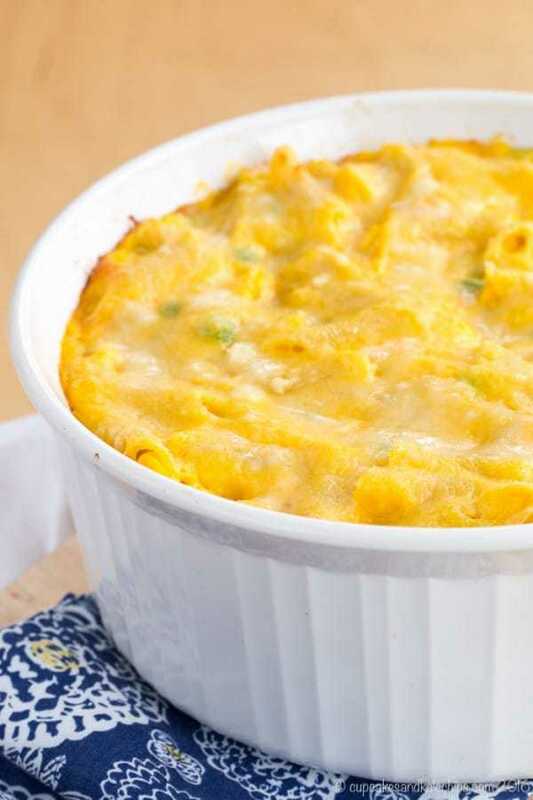 Butternut squash macaroni and cheese is an update to a classic comfort food dish. 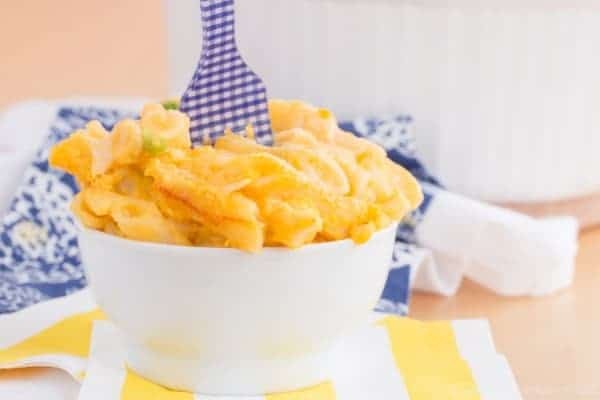 This delicious gluten free casserole recipe puts a healthy twist on mac and cheese with the addition of butternut squash. Take a favorite recipe from your childhood and add lots of veggie power for even more nutrition. 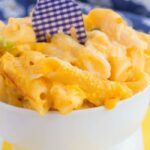 It’s an update on the comfort food classic in this Two Cheese Butternut Squash Macaroni and Cheese recipe. Note: Originally published on April 3, 2012. Photos updated on February 14, 2016. I’m kinda cracking up rereading this post. The Bug, who had just started pre-school when I wrote it is now 5 1/2 and in Kindergarten. I now have Little Dude, and he is almost three and in pre-school. And I pack both of their lunches everyday. You can actually see them posted just after noon on my Facebook page as well as on Instagram, where you can also check out the hashtag #BugsLunchbox. But I hope you’ll enjoy going back in time to where I was as a first-time mom. A few months ago, The Bug started going to pre-school. Technically, since the isn’t even two, it is daycare, but I prefer to call it “pre-school” because it makes me feel like a less lame stay-at-home mom. I am sending him for educational purposes, not to get a bit of a break in order to get some blog posting and photographing chores and errands done, without feeling like I am ignoring him or boring him. To tell you the truth, though, he loves it. Everyday he asks to go to school, and he is always talking about Miss Tracey and Miss Mia. He also loves the food. He will eat things at school that he won’t eat at home, like green beans. And they actually give the kids a pretty wide variety of foods, and a fruit and vegetable with lunch everyday. So really I can’t complain. But the one thing that they do have quite often is some form of pasta. The Bug has had spaghetti and other pasta dishes before, but until I first ventured into gluten-free pasta (with this veggie tomato sauce recipe), we didn’t eat many noodles around here, other than spaghetti squash. Now, after having them so often and loving them at school, he can’t get enough “noodles”. He asks for them ALL.THE.TIME! 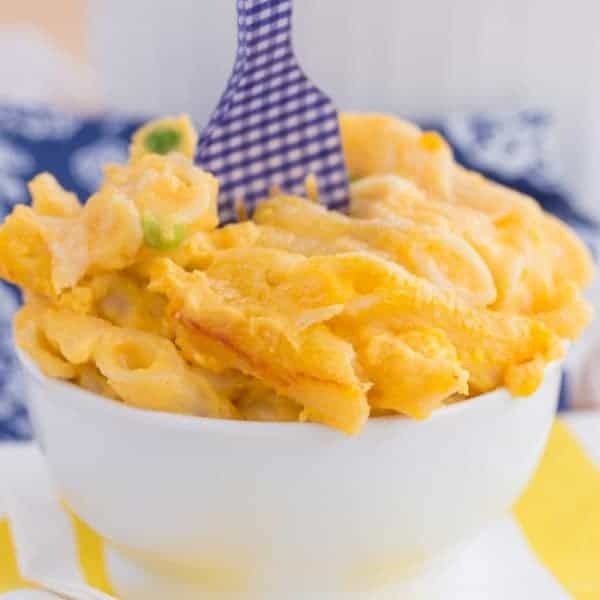 So when The Hubby, said he was in the mood for macaroni & cheese with the roast chicken I made, I thought I should make him and The Bug happy, but I didn’t quite want to go with the super-cheesy fat-, calorie-, and cholesterol-bomb that mac and cheese usually is. I checked out a few recipes, then added a little parmesan and some peas, skipped the flour, and, in my case, used gluten free pasta. 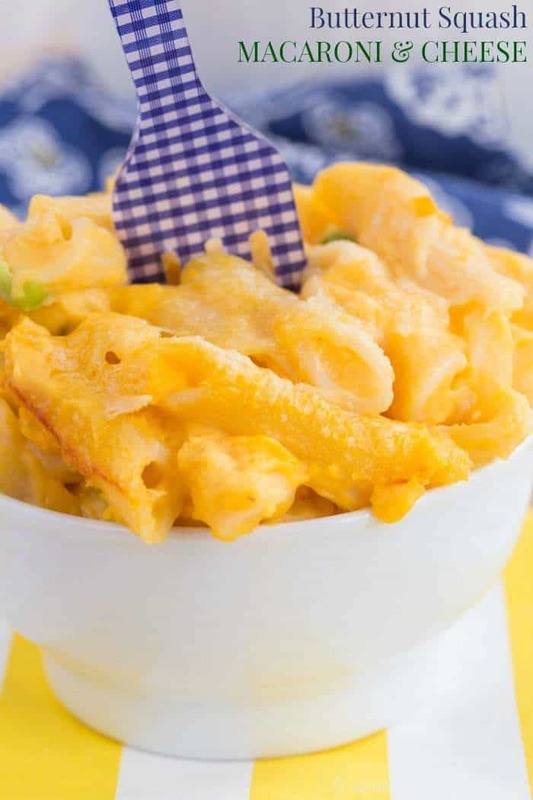 You can use any type and shape of pasta you like in this butternut squash macaroni and cheese recipe. 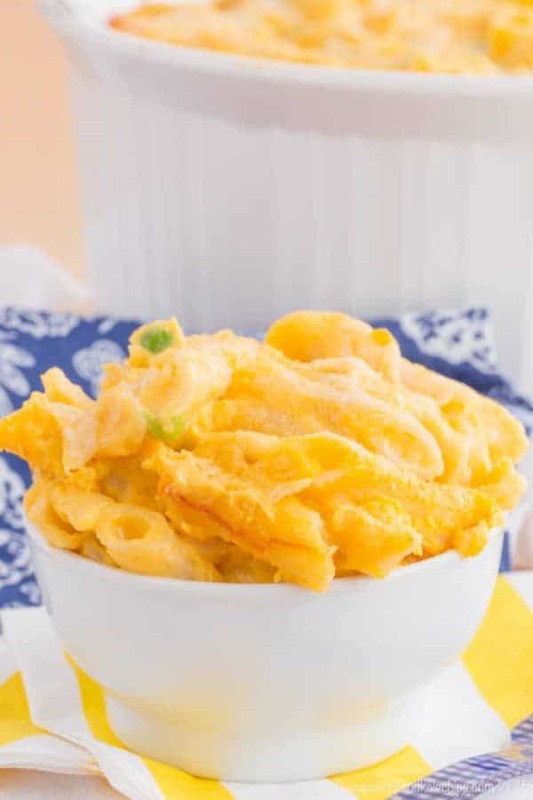 I just think mac and cheese is classic with elbow macaroni. And I baked it, because I LOVE baked macaroni & cheese. It was awesome! The Bug scarfed up plates and plates of it. But then again, he is yet to meet a noodle that he doesn’t like. And I wasn’t too upset that he wasn’t eating much chicken, since he was getting lots of protein from the quinoa pasta. 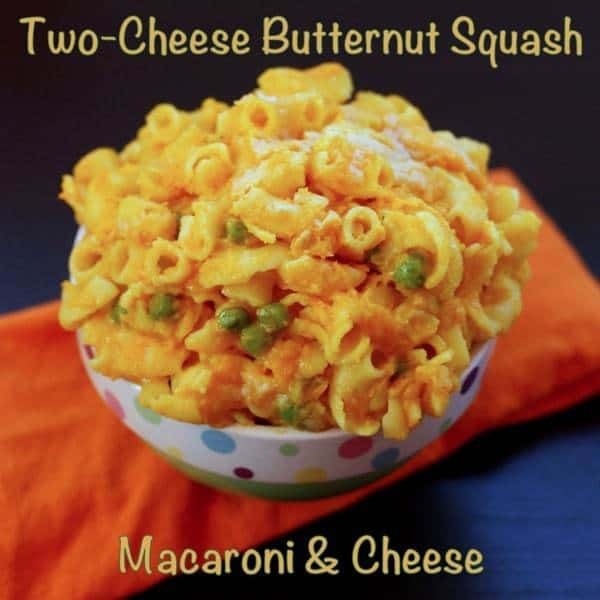 By using extra sharp cheddar and good parmesan cheese, it definitely had that tang and cheesy flavor, and the butternut squash gave it the creaminess that you usually get from butter, flour, and whole milk. 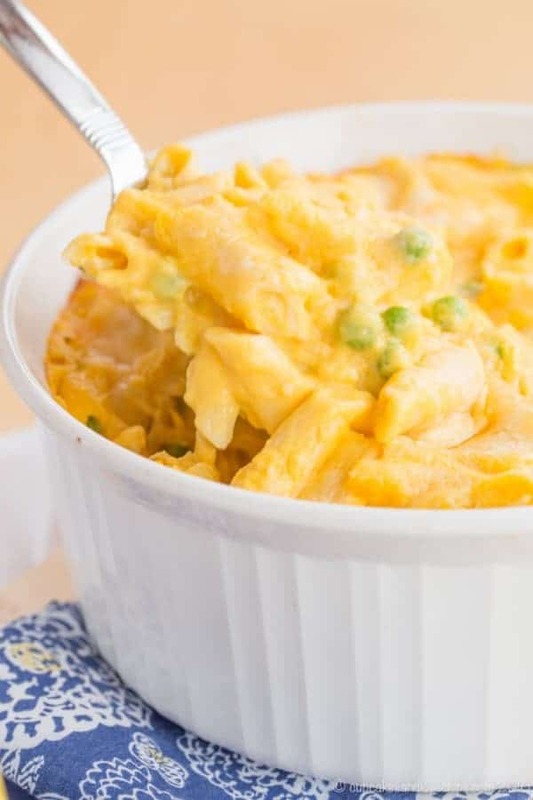 It isn’t quite as cheesy and gooey as your traditional macaroni & cheese, but it is still delicious and creamy, and a little bit healthier. 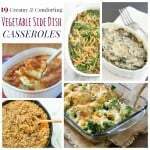 This is even a good way to sneak in extra veggies for your picky eaters. If we had bottomless stomachs, we probably could have finished it all, it was that good. But The Bug and I were happy to devour the leftovers for dinner last night, as part of our parade of leftovers this week. Do you try to sneak in extra healthy stuff for your kids (and significant others)? What is your favorite comfort food? 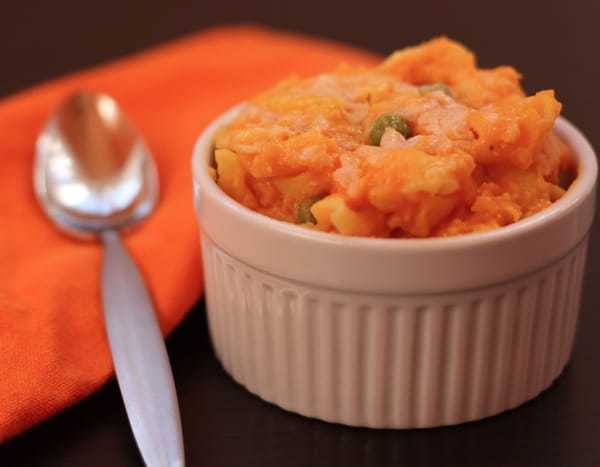 Steam or microwave the butternut squash until it is soft and can be mashed easily, about 15 minutes. Meanwhile, preheat your oven to 350°F. and cook the pasta according to package directions, leaving it slightly under cooked, or al dente. In a blender or food processor, puree the butternut squash with the broth, adding enough so that it becomes a smooth puree. In a large saucepan, combine the squash puree, milk and butter, and heat over medium heat until it just barely comes to a boil. Add the dry mustard, cheddar cheese, and 1/4 cup of the parmesan cheese, and stir until the cheese is fully melted and incorporated. Add the frozen peas, and salt and pepper, to taste. Add the pasta to the cheese sauce, and stir to combine. 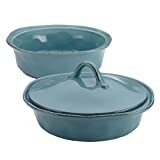 Pour the mixture into a glass or ceramic baking dish, and sprinkle the top with the remaining 1/4 cup parmesan cheese. Bake for 20-25 minutes, or until hot and bubbly, and the top is slightly browned. It’s always fund and kinda scary to look back at the original photos! This looks great! Do you think I could make a batch & freeze some of it? Maybe put it in muffin tins & then freeze them afterwards? Thank you!! Thank you, Seema! I think this recipe would freeze wonderfully! If you’re going to freeze it in muffin tins, I would suggest lining them with plastic wrap so that they pop out more easily. Once they’ve frozen, wrap them in the plastic wrap and store them in a freezer bag. Alsways good to get some extra veggies in those kiddos! I made this and it was AMAZING!!! I been on a squash kick and this was the perfect addition to my fall lineup! Absolutely amazing. My fiancé loved it 🙂 Thanks for this awesome share!!! Oh awesome, thanks so much!! I’ve been planning on making mac and cheese but it hasn’t happened yet. 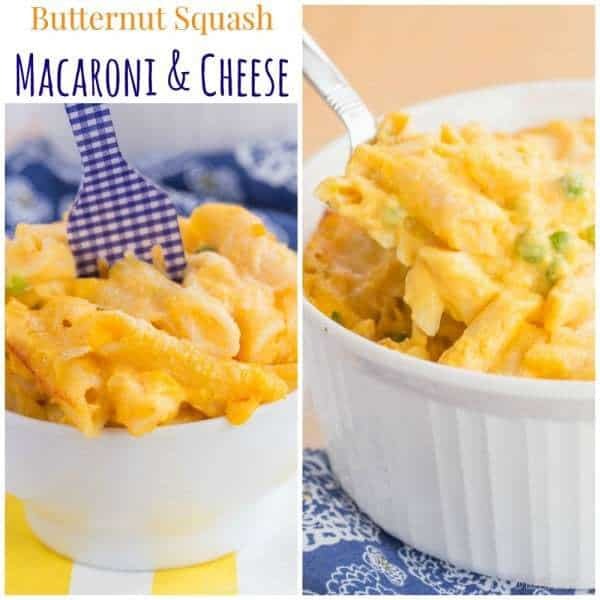 I love butternut and I agree that it would be perfect with mac and cheese. I’m definitely going to try it. I love the little bit of earthy sweetness it gives. But it is not overwhelming, so even non-squash lovers will like it. Sorry for the super-late reply. Blog went on hold unexpectedly for awhile! You caught me! Definitely an omission. I corrected it, but I think this recipe is flexible enough that it isn’t critical when you add it. Hope you enjoyed! My son keeps BEGGING me to buy the blue box macs and cheese but I refuse to do it. Maybe this recipe will convert him away from that nasty processed stuff. Thanks for linking up at A Little Nosh! My little guy has gotten Annie’s Bunnies & Cheese a couple times, but I much prefer to give him this or another homemade version! 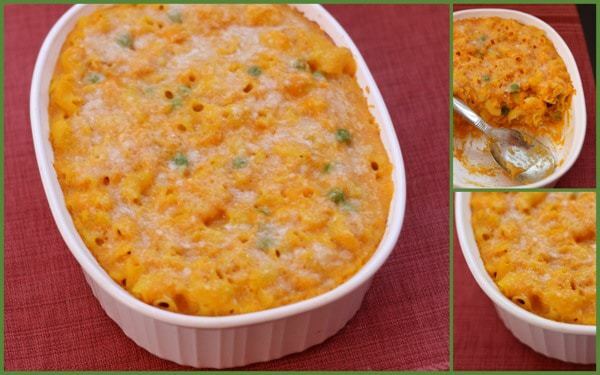 I have never had butternut squash macaroni and cheese. This looks really good. I think this is a great recipe for kids, without them knowing they are eating really healthy. Thanks for sharing at Showcase Your Talent Thursday and I can’t wait to see what you have to share at the next party! Thanks! Yes, I try to get my little guy to see and try lots of foods, especially veggies, and he is pretty good about it. But if I can sneak in a few extra ones here and there, I like to. 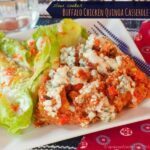 This is a beautiful dish and a meal in one, I look forward to making this delicious recipe! Hope you have a wonderful week and thank you so much for sharing with Full Plate Thursday. Thank you. I hope you do try and enjoy it. This looks delicious, I love how you made it healthier too. Now if only I can find quinoa pasta, I bet I would love it. 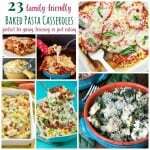 thanks for sharing on Newlyweds recipe linky, I pinned this recipe too! Thanks for stopping by and for pinning. And you could totally make this with regular pasta! wow! that sounds awesome and looks really delicious! Thank you! It was unexpectedly delicious. Thanks! Somehow it was both light and rich. It isn’t cheap, but every once in awhile is not so bad, especially since I have to try to stay away form the regular stuff. Sometimes it is just nice to have spaghetti or mac & cheese. Your photos look really great! 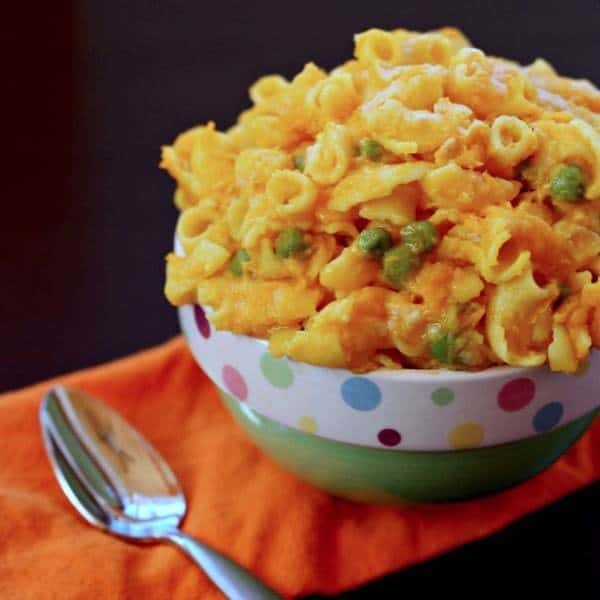 I made a Martha Stewart recipe once for butternut squash mac and cheese. It was so good! The kids loved it until I told them it had squash in it. Now every single night, no matter what I make, they say “Is there squash in this?”. That is too funny! My little guy loves butternut squash anyway. The hubby would have preferred the “real” stuff, but he liked this. WOW! the pictures are so amazing! Glad the Bug loved it! Love how you added color to it! Might need to do that with some broccoli on my end! Thanks for the tag! Thank you! I have been working a lot on photography! It was really good – thanks for the inspiration. Broccoli would be great! I’ve been mac & cheese obsessed the past 2 days! Except mine didn’t look as good as this! Mine was kraft Sponge Bob Mac & Cheese in a cup! lol But I did add a slice of pepper jack and a minced sun-dried tomato to give it some flare! I LOVE how you fancied up the Kraft Mac! I bet that was tasty. Homemade is good, but sometimes the box stuff beings back such great childhood memories.